This week there are 4,616 students at the BT Young Scientist exhibition who are demonstrating the depth of our national talent base. This is timely, as following the economic downturn Ireland’s economy is now growing again. A large part of the growth is being driven by Foreign Direct Investment (FDI) and export-orientated businesses. However, the narrative to promote industry investment has evolved; Ireland is now building an investment case based on talent. There are many indicators of this transition. The recent Forfás policy statement on FDI in Ireland highlights both talent and research as key investment factors; the American Chamber of Commerce published a report on “Ireland as a global centre for talent”; and Martin Murphy Hewlett Packard’s MD at the Dublin Chamber of Commerce annual dinner noted that future internationally mobile investment will be increasingly won by regions with talent availability. Consistent with these trends Ireland is developing new innovation policy. The recent budget highlighted improved R&D tax credits and the new concept of a “knowledge box”. These new initiatives are dependent on talent. A more advanced economy demands more advanced skills and talent. If there is agreement on the importance of talent, has investment in research during the recession resulted in a stronger talent base for Ireland? How do we know that our companies require a technical and more highly trained talent base? Trinity College Dublin, in partnership with LinkedIn, has carried out an analysis of 11,000 PhD graduates from Irish universities over the last 20 years. The study looked at where these PhD graduates took their first job, the transition from academia to industry and how they compared with bachelor graduates during the same period. The data is based on LinkedIn profile information and is one of the first studies to capture a longitudinal analysis of the careers of our PhD graduates. An interesting insight is the transition process from PhD to industry. Fifty-eight per cent of graduates following completion of their PhD took up a first role in academia. However over time this situation changed significantly and by their fifth post, 63 per cent of the PhD graduates were working in industry. The average time for a PhD graduate to transition from academia to industry was 2.7 years. This demonstrates that post-doctorate research is considered an additional career training step. It also highlights that there can be a seven-year window from the first investment in a PhD to a pipeline of industry-ready graduates. Research and talent development takes time. The LinkedIn data shows a doubling of PhD graduates working in industry in the period 2000 to 2010. This represents both the growth in numbers undertaking PhD training and also the increased absorptive capacity of industry. It also demonstrates how the ambition of Ireland’s Science Technology and Innovation Strategy in the period 2006-2013 to double PhD numbers has directly impacted on our talent competitiveness. This is an important input as our new science strategy is being developed. The study also shows that a PhD graduate fills a different role in industry. More than 32 per cent of PhD graduates who move into employment in industry have roles in research; with another 21 per cent involved in engineering and information technology roles. In comparison, only 5 per cent of the 70,000 BSc graduates who have LinkedIn profiles for the same period are working in roles in research. In addition, the analysis shows that PhD graduates take more senior positions in industry than graduates – 46 per cent of PhDs versus 29 per cent of graduates enter in a “senior contributor” role. This strong interest in PhD graduates by employers is consistent with their skill profiles. PhD graduates have a more diverse and broader technical skill set than the graduates surveyed. In summary PhD graduates offer different skills, carry out different roles and fill more senior positions than the graduates surveyed. 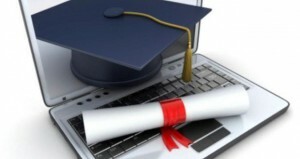 A PhD is a different form of education and increasingly a form which is demanded by employers. Over this period, the survey shows Trinity College Dublin to be Ireland’s largest provider of PhDs; supplying 20 per cent of the national total. Trinity is using innovative approaches to develop researcher skills and to link them with industry. Initiatives like the Trinity Innovation and Entrepreneurship strategy; the Trinity-UCD Innovation Academy and the newly formed Office of Corporate Partnership and Knowledge Exchange all focus on developing our PhDs to deliver both world-leading research and industry understanding. Investing in research produces many tangible impacts: scientific learnings; intellectual property which can be commercialised and international collaborations which enhance our capacity to innovate. However, the most important benefit is talent. Graduates in a range of disciplines and at different levels make up the national talent pool but increasingly research-trained PhD graduates can help differentiate Ireland internationally. At Trinity College Dublin, only eight out of 301 students who sat psychology between 2004 and 2013 failed to achieve a 2.1 or a first. Are university grades being inflated to suit jobs market? 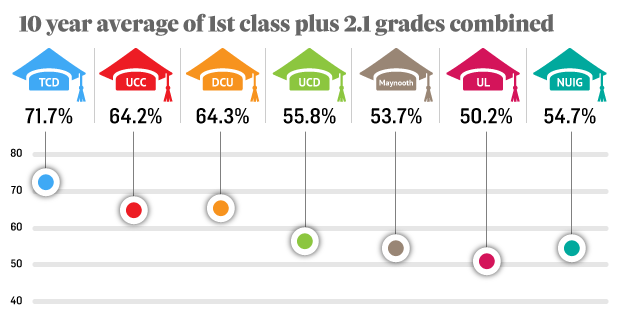 The figures, obtained by The Irish Times under the Freedom of Information Act, also show that a general increase in the percentage of students getting a 2.1, the next highest grade to a first. The university said this was due to the fact that it attracted “exceptionally bright cohorts of students”. Many companies, especially in finance and law, demand a first or 2.1 for entry-level jobs or internships. The founder of The Summit web company, Paddy Cosgrave, sparked controversy earlier this year when he said it would only accept interns who had got a first, with the exception of Trinity graduates where a 2.1 would be allowed. Mr Cosgrave, a TCD alumnus, argued that “a 2.1 in one university would not equate to a 2.1 in another university”. The figures show that, between 2004 and 2013, an average of 71.7 per cent of students at TCD graduated with either a 1st or a 2.1. DCU and UCC had the next highest rate of such awards (64.3 per cent and 64.2 per cent respectively), followed by UCD (55.8 per cent), NUI Galway (54.7 per cent), Maynooth University (53.7 per cent) and University of Limerick (50.2 per cent). While the overall figures raised questions for particular universities, there were more general signs of grade inflation at faculty level. What’s the easiest course in which to get a first? Computer science and software engineering at Maynooth University has relatively strong credentials, with 38 per cent of students over the past five years receiving the top grade. And in 2012, a particularly good year, 59 per cent of participants got a first. More than 90 per cent of law graduates in TCD receive either a first or a 2.1. 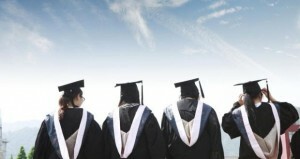 Photograph: Dara Mac Dónaill Are university grades being inflated to suit jobs market? Engineering, manufacturing and construction at NUI Galway recorded similar stellar results, with 36 per cent of students between 2004 and 2013 getting a first. 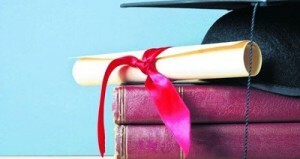 In 2007, 112 of 239 graduates (47 per cent) under the faculty heading received the top grade. But for a consistently high ranking, psychology at Trinity College Dublin takes some beating. Only eight out of 301 students who sat psychology between 2004 and 2013 failed to achieve a 2.1 or a first (which translates as a 97 per cent success rate). Last year, 13 of the 32 students taking final exams (41 per cent) got a first. Of course, higher grades don’t necessarily mean inflated grades. Asked to explain the figures, TCD said its psychology course “attracts exceptionally bright cohorts of students who, in the four years of the degree, achieve a very high standard which is vetted by a wide range of external examiners. 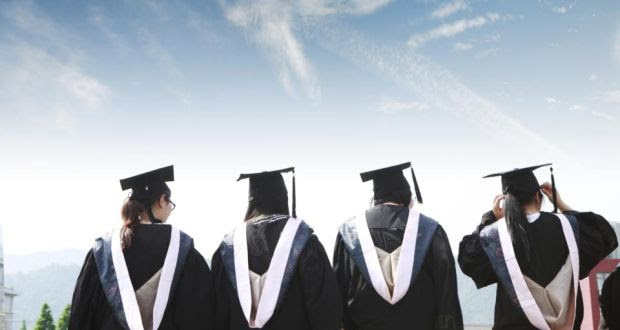 Martin O’Grady, a lecturer at Tralee Institute of Technology, who has previously published research on grade inflation, said “robust, independent monitoring” was needed to establish whether certain courses were being marked too easily. In general, he says, “the institution that takes in the weaker students are elevating their grades, whereas TCD don’t have to do that”. 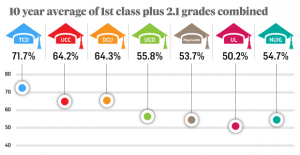 Previous research showed that the percentage of first-class honours awarded across Irish universities rose from 7 per cent in 1994 to 17 per cent in 2005. The latest figures indicate there has been a small decline since in most universities but one counterbalanced by a rise in the awarding of 2.1s. While the overall figures raised questions for particular institutions, there were more general signs of grade inflation at faculty level. At UCD, the proportion of students gaining a first or 2.1 in science jumped from 37.5 per cent in 2004 to 59 per cent in 2013, although this was largely accounted for by a change to the grading system in recent years. At DCU, the last three years saw the highest grades in science, maths and computing, with 71.5 per cent of students gaining a first or 2.1 in 2013 compared to a 10-year low of 53.8 per cent in 2005. 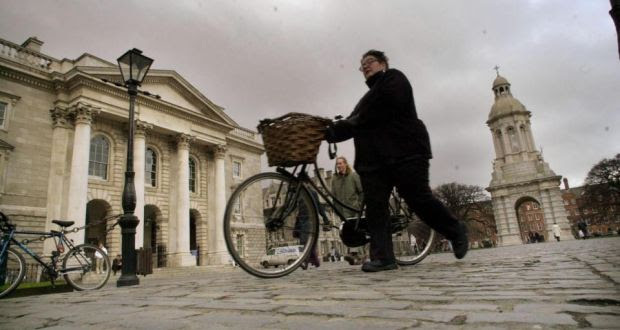 As to comparing awards between universities, in humanities, for example, TCD came out top, with 16.6 per cent of graduates in the last five years obtaining a first and 65.1 per cent getting a 2.1. At UCC, in arts, social sciences and Celtic studies, 13.2 per cent got a first and 47.3 per cent got a 2.1. For UCD arts, 8.4 per cent got a first and 46.3 per cent got a 2.1. In humanities at NUI Galway, 8.8 per cent got a first, and 40.2 per cent got a 2.1. As for the toughest course in which to get top marks, medicine stands out. Over the last 10 years, just 38 of 1,263 TCD graduates got a first and only 56 out of 1,731 UCD graduates did so. In both cases, this translates as a 3 per cent success rate. Stormont screws University of Ulster to the wall. Students beware! to meet part of this year’s required cut in staffing expenditure. * Achieve the remaining £1.1 million required saving in the staffing budget by tight control over the approval of replacement posts. Since 2011 the Stormont Executive have already cut university budgets substantially with Ulster being required to absorb cuts of c£12million. for each student than do universities in England. And over £2,000 less per year for each student in some subject areas. This is a serious underinvestment in the future of our young people by the Stormont Executive. and we have to pay more through our access agreement. with the obvious implications for our ability to compete with them. Whilst we have taken action to deal with the current situation, the Stormont budget will be cut further next year if welfare reform is not implemented. We cannot ignore this possibility and are considering options for dealing with future cuts. I will keep you informed about this, but further restructuring is likely to be required. Politics is about choice and it is not for us to comment on the merits or otherwise of welfare reform. But choices have consequences. And a consequence of the decisions at Stormont is that there is now serious underinvestment in the future of our young people. Those consequences may not be evident immediately but they will be before long. TCD also fell in the latest ratings from Times Higher Education (THE), a British publishing firm, slipping from 129th to 138th place. In 2010, TCD was ranked as high as 76th and the previous year, in a joint survey between THE and another rankings company QS, it was 43rd in the world. UCD’s decline in the THE rankings has been even sharper in that period, falling from 89th in 2009 to 161st last year. It is now ranked in the 226th-250th bracket for 2014. There was better news for NUI Galway. It leapfrogged UCC into third place among Irish universities (rising from 301st-350th to 251st-275th). UCC remained unchanged in the 276th-300th bracket, while the Royal College of Surgeons in Ireland entered the top 400 at 351st-400th. The three other universities in the Republic remain outside the top 400, as does the University of Ulster. Queen’s University Belfast remained unchanged in the 251st-275th bracket. UCD president Prof Andrew Deeks described the results as “very puzzling, coming only two weeks after the release of the QS ranking, which, based on objective measures, showed us holding our place at 139. The proportion of young people in Ireland who are unemployed and not engaged in any training or education programme is higher than other developed countries, according to a study published by the OECD. This year’s ‘Education at a Glance’ report found that 22% of Irish young people are in this category, compared to an EU and OECD average of 15%. In its latest report comparing education systems and outcomes the OECD has found that young people here are far more likely to complete second level education. Two years ago, 93% of Irish teenagers were expected to complete secondary school, compared to an average OECD rate of 84%. However despite high rates of educational achievement here the OECD says Ireland’s general unemployment rates remain higher than average compared to other member states. On spending, the latest data finds that Ireland has the third greatest annual expenditure per student compared to all other OECD countries. This figure excludes money spent on research and development. The only countries with greater expenditure are Canada and the US. When taken as a proportion of overall spending however, the study finds that Ireland’s expenditure, at 6.2% of GDP places it in 18th place out of 37 OECD counties. That’s slightly above average but far below the proportions spent in Scandinavian countries. In the classroom, this study finds that Ireland’s pupil teacher ratio is worse than the OECD and EU average. At second-level Ireland has one teacher for every 15 students. That compares to an EU average of one teacher for every 12 students. In Primary education there are 16 pupils here for every teacher. The EU average is 14 pupils per teacher. The study finds that Irish teachers engage in more teaching time than average, at 915 hours per year at Primary level here compared to an average of 761 hours annually across EU states. The figure at second level is also considerably higher than the average. The study finds that teachers here are well paid by OECD and EU standards. Salaries here are higher at all levels compared to the average across other countries. The Dublin company behind English language school BCT Institute has gone into liquidation with debts of over €350,000. It is the sixth private language college to close since last May. 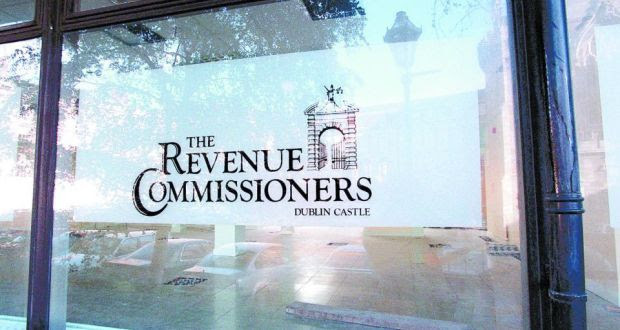 Revenue was said to be owed €64,495 and Dublin City Council €65,000 in rates. BCT closed its doors on what it said was a temporary basis last month after it was suspended from a list of authorised colleges. Today, Declan de Lacy of PKF O’Connor, Leddy & Holmes was appointed as liquidator to HSD Education Limited, which traded as BCT at Dublin’s Parnell Street. Muhammad Hafeez, a director of the company, attended the creditor’s meeting but was unavailable for comment afterwards. Luis Pinto, a former student at BCT, said he understood about 50 students had been left “in limbo” without being transferred to another college. A lot of students had lost their fees, and felt it was unfair they were being asked to pay again under the subsidised scheme set up last month by the industry body Marketing English in Ireland (MEI). Under the scheme, courses are being offered at a discount of up to 70 per cent for the estimated 2,000 students affected by the closures. 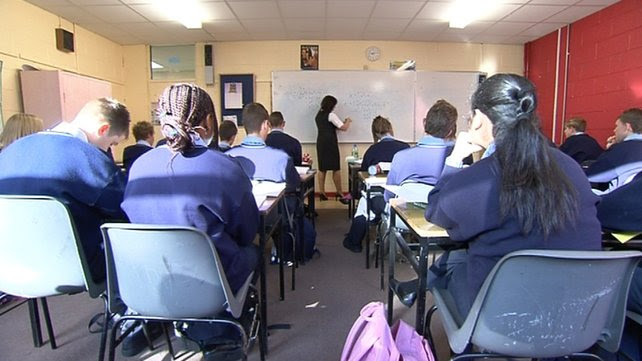 Four of the other language schools to close were in Dublin – Kavanagh College, Eden College, Irish Business School and Millennium College – while the fifth was in Cork: the Allied Irish College on South Mall. Alumni employment, for example, is measured by the number of alumni holding CEO positions in the world’s top companies relative to the university’s size.